Benjamin Moore's Colour Trends 2017 features a palette consisting of 23 deep, saturated hues. In curating the palette, the Colour Studio lent significant consideration to the pairing of colours and relationships between colour families, as well as a newfound level of colour confidence in deeper hues among design professionals and consumers. The inspirational Colour Trends 2017 colour card illustrates the use of colour in ways that celebrate how shadow and light travel throughout a space during the course of a day. 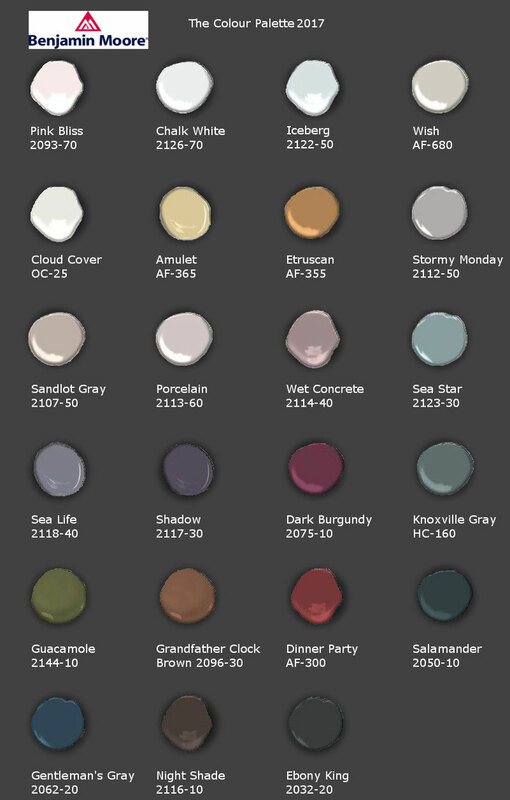 The majority of hues in Benjamin Moore's Color Trends 2017 can be found in their Colour Preview collection. Bold, saturated colours bring spaces to life for those looking to illuminate their world with pure, extraordinary colour. Colour Preview offers a collection of 1,232 hues that excite and inspire with pure, deep, clear colours that create striking combinations. Visit us at Upper Village Paint & Wallpaper to experience the vibrancy of Benjamin Moore’s Color Trends 2017. Our knowledgeable and friendly staff will be pleased to take you on a colour tour. The richness and nuance demonstrated through the Colour of the Year and Colour Trends 2017 palette can only be achieved with Benjamin Moore products. Offering residential and commercial paints for any project, the Benjamin Moore portfolio includes Aura®, Aura® Bath & Spa, Regal® Select, Natura® ben®, ADVANCE®, ARBORCOAT® and Aura® Grand Entrance®. All 3,500 Benjamin Moore colours are available in pint samples at local retailers along with Colour Trends 2017 curated palette cards. Benjamin Moore products are exclusively found at the more than 5,000 Benjamin Moore independently owned paint and decorating retailers across the U.S. and Canada.